Established in the year of 2007, we "Universal Textile Industries" are a reputed organization of the industry involved in manufacturing, supplying, distributing, exporting & service providing a commendable array of Testing Equipments. Under our quality assured product selection we are providing best quality Textile Testing Equipment, Concrete and Cement Test Equipments and Rubber Testing Equipment. These products are developed and designed in tune with the international quality standards by utilizing finest grade basic material. Our provided testing equipments are highly acclaimed for their accurate measurement and sturdy construction. We are offering these products at leading prices in the market as per the requirement of our customer. With the visionary guidance of our mentor Mr. Pradeep Kabdwal, we are able to set this benchmark in the industry in such short period of time. His rich knowledge%u200B of the market and ability to handle the various situations enable us to be a leader of this realm. For more in detail kindly find the attached pdf or see the attached image. Our offered products are checked for quality at every manufacturing stage. We source the basic components for the offered products from reliable vendors of the industry; our skilled professionals manufacture these products using new technology methods. Our quality experts check these products against diverse parameters to ensure the products offered are in full compliance with the industry quality standards. We have a team of specialist engineers and technocrats,who are actively involved in R & D for the development of new test methods and hence to provide more user friendly, reliable and industry specific testing instruments. Our professionals not only have vast technical knowledge but also have experience in managing customer relationships. 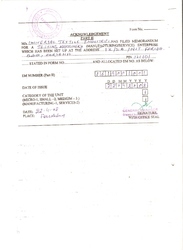 Registered with Small Scale Industries. We are backed by a well-equipped infrastructure. We have installed all the useful machines in our infrastructure facility thus we are able to cater the bulk requirements of our clients. Further, for the smooth and reliable working, we have separated our infrastructure into different operational departments. We manufacture the equipments that meet the international standards of testing like ISO, AATCC, BS, IS and ASTM etc. our equipments are accepted widely among the manufacturers as shown in our valued client list and many more. Our company always believes in offering high grade quality testing equipments to our valued clients all across the market. Our offered product range are manufactured from quality approved basic components sourced from authentic vendors of the market and are highly reckoned for their remarkable attributes like optimum quality and longer service life. 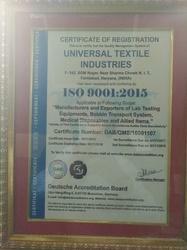 Universal Textile Industries is one of the company of Universal Group and is known as leader amongst the manufacturers and suppliers of a wide range of high quality testing equipment for textiles, polymers, rubber and paper, leather, plastic etc. We have appointed a knowledge able pool of skilled professionals, which works in close coordination with our customers to provide them the best quality products. Our highly skilled quality professionals tested the entire products at all phase and ensure that the offered products are inspected for numerous parameters. We arrange time to time seminar sessions for all our professionals to make sure that they are in aware with the modern market trends.